Once you’ve confirmed your cat allergy, the first things doctors will tell you is to get rid of your cat. Most of us won’t do that. 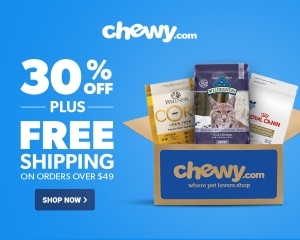 By taking advantage of multiple treatment methods including grooming, environmental management, and medications, you can reduce your allergy symptoms to a manageable level and may be able to enjoy life with your cat. In this article, we’ll focus on using antihistamines and other medications for cat allergies. Antihistamines block histamine, which is a biochemical messenger that triggers the immune response we characterize as an allergic reaction. Hate drowsiness and want to feel fresh? Choose new generation antihistamines. Antihistamines were developed in the 1940s. Early antihistamines penetrated the blood-brain barrier to reach histamine receptors in the brain. Older antihistamines are referred to as first-generation antihistamine drugs. The older that an antihistamine is, the greater the likelihood of drowsiness and other side effects. These antihistamines are still on the market today. Perhaps the best-known example is Benadryl or diphenhydramine. In the 1980’s, scientists developed a second generation of antihistamine drugs. New antihistamines cross the blood-brain barrier to a lesser extent than do first-generation antihistamines. Consequently, they cause fewer side effects and are usually non-drowsy. They’re usually longer-lasting, allowing you to dose once daily rather than once every few hours. For most allergy sufferers, newly-developed antihistamines provide relief without side effects. Not to be confused with the anabolic steroids your jacked-up brother-in-law probably uses, corticosteroids target inflammation to minimize allergy symptoms. Nasal steroid sprays fight the stuffiness, itching, and runniness that make you and your nose miserable. Sensitive individuals may find that nasal steroids make their nose feel even worse. Side effects are rare, but they include nosebleeds and, ironically, runniness. Decongestants shrink the blood vessels in your nose, promoting airflow and helping you breathe easily. This is great when you haven’t breathed through your nostrils all day, but it’s important to remember that with shrunken blood vessels comes increased blood pressure. If you already have high blood pressure, this could be a problem. Decongestants pose a risk to those suffering from glaucoma, heart conditions, diabetes, and thyroid disease. In essence, decongestants can help you breathe, but they can also make other problems a lot worse. Therefore, decongestants aren’t a good choice for most cat allergy sufferers. Watch out for medications that contain acetaminophen. Acetaminophen, the active ingredient in Tylenol, is added to some allergy medications to relieve headaches or other allergy-related pain. But it might not be a great inclusion in your allergy meds. Some medications contain 650mg of acetaminophen in every dose. With a dosage frequency of every four hours, a day of allergy medications would come with nearly 4,000mg or a maximum dose of acetaminophen in one day. If you’re just feeling a little bit scratchy in the throat, a maximum dose of painkillers isn’t necessary or beneficial. And remember—acetaminophen isn’t necessarily harmless. Fexofenadine is a second-generation antihistamine that minimizes the severity of sneezing, runny nose, itchiness, and fatigue. Compared to sedating first-generation antihistamines, the drug has a limited ability to cross the blood-brain barrier. This makes it a relatively non-drowsy drug. The most common side effect among adult patients is a headache. 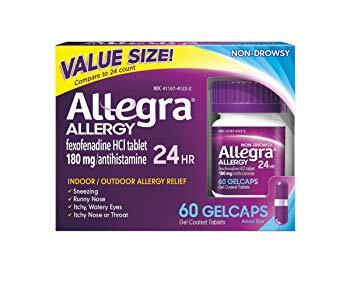 It’s sold under the brand name Allegra, but has been available as a generic drug since 2011. This product is in a gel cap form, making it easy to swallow. It’s a fast-acting formula that starts producing results within an hour of dosage. Its effects last for up to 24 hours afterwards, giving you an entire day of protection. It’s appropriate for people age 12 and over. Each gel cap offers 180mg fexofenadine. Cetirizine is a second-generation antihistamine that minimizes sneezing, runny nose, itching, allergic conjunctivitis, and hives. As a newer product, it’s long-lasting and non-drowsy. You’ll need to take just one tablet in the morning for all-day protection. You’ll find cetirizine branded as Zyrtec, but the generic version works just as well for a lower price. 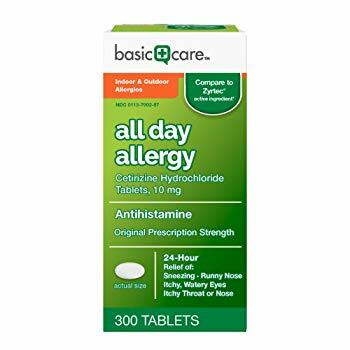 This antihistamine from Basic Care is sold at a very low price on Amazon. 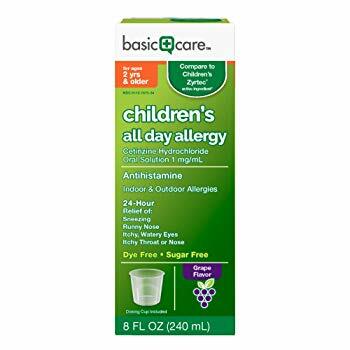 The product is approved for use in adults and children ages six and over. Each tablet provides 10mg cetirizine. Nasal steroid sprays are generally the most effective allergy treatment on the market. Triamcinolone is a synthetic glucocorticoid, which means that it bonds to glucocorticoid receptors in the body. Glucocorticoids are naturally present in the body and help to regulate immune function and inflammation. By introducing a synthetic version of these hormones, you can produce an enhanced anti-inflammatory effect. 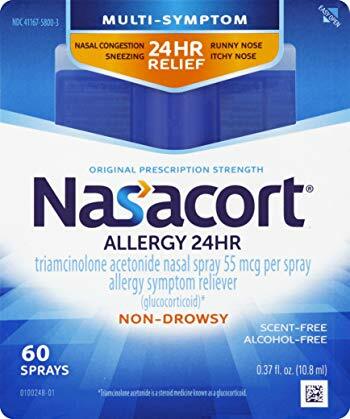 This 24-hour spray from Nasacort relieves congestion, sneezing, and itchiness. It’s alcohol and scent free, so it’s unlikely to cause irritation. It starts working on the first day and provides the maximum effect after a few days to one week of daily use. Remember that nasal steroids are contraindicated for use in people with glaucoma, ulcers, or cataracts. You also should avoid this product if you’re using other steroid medications. This medication is made with cetirizine and is formulated for children. Each 5ml serving contains 5mg Cetirizine Hydrochloride. The grape-flavored liquid solution is palatable and easy to administer. It’s dye-free and sugar-free. Instead of sugar, the formula uses sorbitol and sucralose as substitute sweeteners. It’s a good generic product that you can find at a very low price on Amazon. The Amazon listing comes with a simple dosing tracker so that you can make sure that the dosing is just right. Although it’s sold for children, it’s also appropriate for adults who prefer liquid medications. Remember—allergy medications are just one part of your cat allergy treatment plan. We mentioned at the beginning of the article that medications aren’t a complete solution. 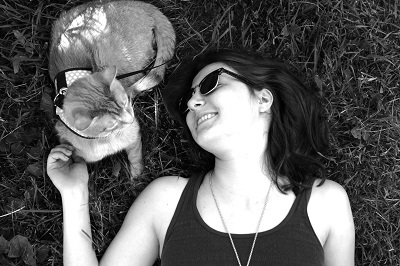 With a multifaceted approach, you can reduce your cat allergies to a manageable level. Here are a few steps to bring you closer to that goal. Start with the allergens on your cat. Remember that cat allergens are secreted in your cat’s skin, saliva, and urine. By removing those allergens from your cat’s body, you can cut back on the allergens in your environment. If possible, a non-allergic individual should handle these tasks. Wash your cat, potentially using an allergen-blocking shampoo. While washing with an ordinary shampoo or dish soap will help, an allergen blocking shampoo may be even better. There’s some evidence that allergen-blocking shampoos can neutralize dander. Just don’t bathe your cat more than once or twice a week. Any more could dry out their skin. While cat hair isn’t allergenic itself, it carries dander and saliva, both of which contain cat allergens. By brushing your cat and throwing away the hair, you’ll minimize the amount of hair and dander in your home. Keep your cat’s skin healthy. Unhealthy skin breaks and flakes and sprinkles through your house. By improving your cat’s skin and coat health, you can minimize the amount of allergenic dander in the area. Omega-3 fatty acid supplements and a stellar diet can keep your cat’s skin and coat supple and strong. Reduce allergens in the environment. At roughly 1/10th the size of a dust allergen, these microscopic particles become airborne and remain in the environment for up to 6 months after the cat is no longer in the area. Regular cleaning is a necessity for those with cat allergies. Here are a couple ways to make a big impact. Capture airborne allergens with an air purifier. Not all air purifiers are equal, but the best ones capture these microscopic particles and make a big difference for allergy sufferers. A powerful Roomba vacuum removes cat hair and dander from carpet and upholstery. If you choose one with a HEPA filter and minimal exhaust, allergenic particles will remain trapped in the vacuum and won’t re-enter the environment. Click here for our list of the best vacuums for pet hair. Are you asking how much allergy medicine you should give a cat? It’s best to consult your veterinarian before giving your cat an antihistamine or other medication for allergies. Of the drugs available, cetirizine (the active ingredient in Zyrtec) is the safest and most widely used in veterinary practice. Dr. Shelley Knudsen, DVM of All Feline Hospital in Lincoln, Nebraska recommends “½ of a 10mg tablet (5mg) once daily.” If you want to take a safer route, consider salmon oil or fish oil. Fish oil is rich in omega-3 fatty acids, which can reduce allergy-caused inflammation without any known side effects.